Starting with the earliest regeneration of the Doctor and moving clockwise, each player takes their turn. After each player has their turn the Daleks then have a turn. This process repeats until either: one or more players wins the game, or the Daleks win the game. During your Prepare step, you gain Sonic Charge tokens, and may Uninstall Equipment, Install Equipment, and Dismiss Companions. At the start of your Prepare step, place two additional Sonic Charge tokens on your TARDIS Console (up to a maximum of five tokens). You must do this before you use any Timey-Wimey or Companion card effects. 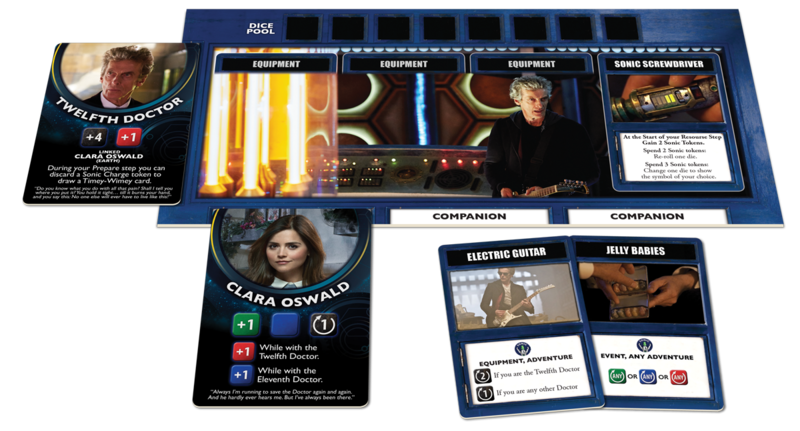 Discard any unwanted Equipment Timey-Wimey cards from your TARDIS Console, freeing up Equipment slots for other Equipment cards. 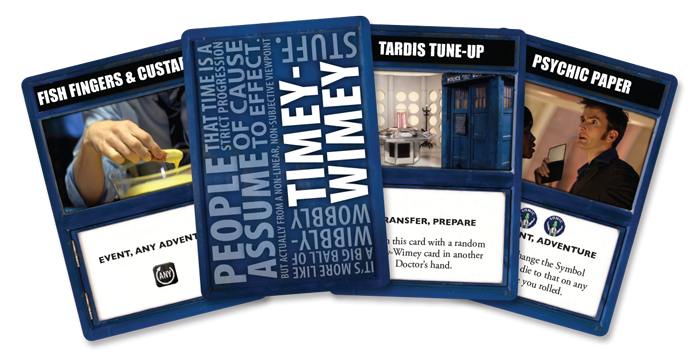 Play Equipment Timey-Wimey cards from your hand into empty Equipment slots on your TARDIS Console. You must pay the Sonic Cost of the Equipment card when you install it on your TARDIS. You do not need to pay the Sonic Cost to use the card after that. Dismiss any unwanted Companions from your TARDIS Console and shuffle any Dismiss Companions back into their Companion decks. During this step you fly your TARDIS to a new location or try to solve an unfinished Dilemma at your current location. When traveling to a new location you roll the TARDIS die. If you roll the TARDIS symbol you may go to a location of your choice. If you roll the Question Mark symbol, the TARDIS decided she knew where you ought to be, and you go to a random location from the top of the deck. If you wish to move to a Location other than Earth or a Time Anomaly, you must roll the TARDIS die. 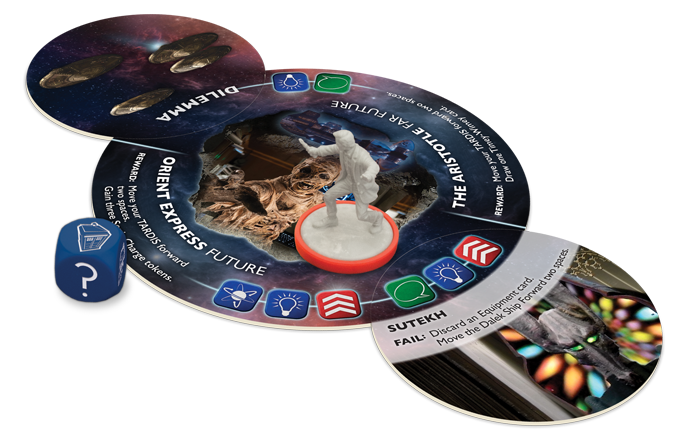 • On a roll of a TARDIS Symbol, you may either: Move your Doctor marker to any Time Zone on any Location in play, or Draw two Location tiles. Discard one and place the new Location tile on the table. Move your Doctor marker to one of the Time Zones on the new Location. • On a roll of a Question Mark Symbol, the TARDIS has decided that she knows where you need to be. Draw a Location tile and place it on the table, then move your Doctor marker to one of the Time Zones on that Location. Its So Much Bigger on the Inside! If you have an empty Companion space on your TARDIS Console, you may recruit a Companion at the start of your adventure. If you are on Earth draw from the Earth Companion deck. If not, then draw from the Alien Companion deck. If you are on a Time Anomaly, you may recruit a Companion from either deck. 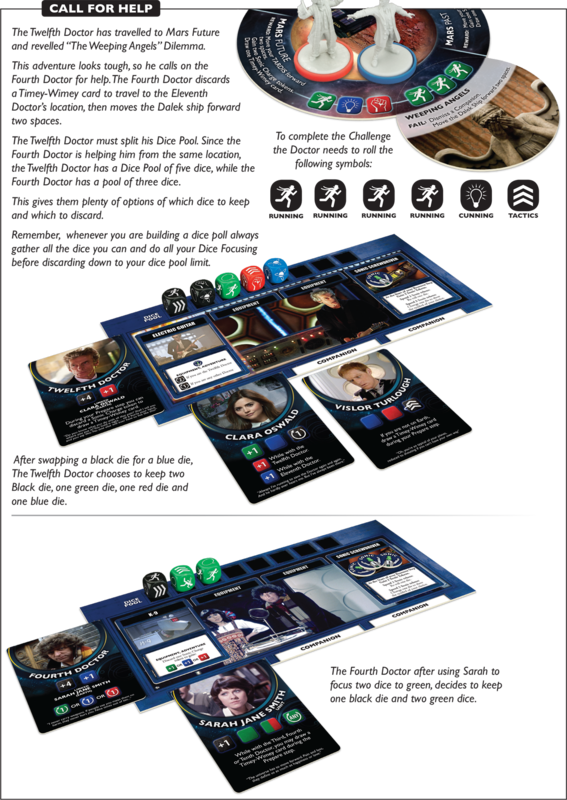 The newly recruited Companion card is a Part-Time Companion, and will only become a Full-Time Companion if you succeed in the Adventure. Show this by leaving a gap between the Companion card and the TARDIS Console. If you have a Link to a Companion, you may search the Companion deck for that Companion to recruit, instead of drawing one at random. The combined symbols on the Location and Dilemma set the Challenge that you will need to meet to complete this Adventure. 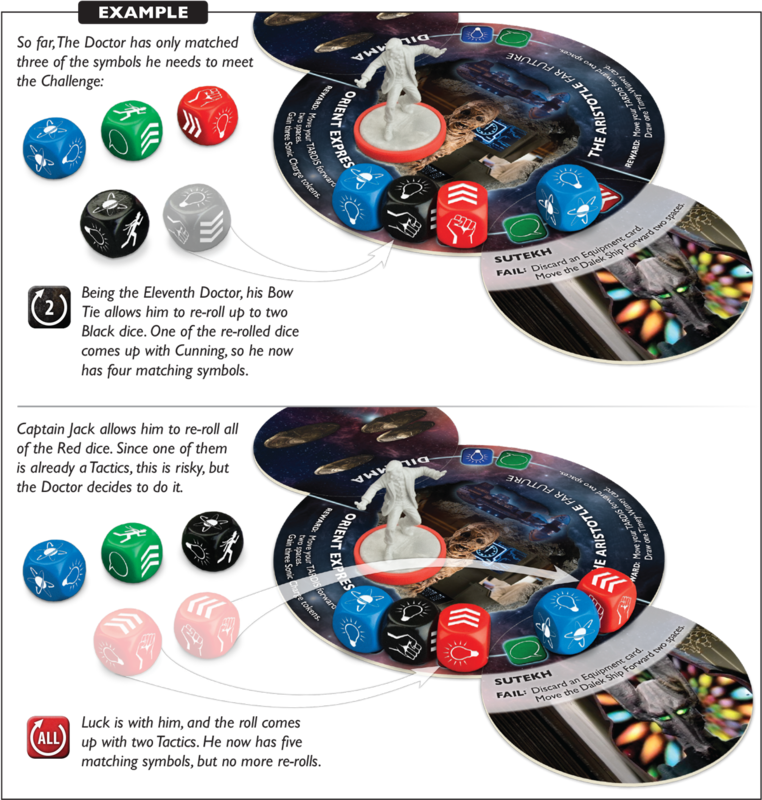 You create the Dice Pool by gathering the Story Dice of your Starting Dice Pool, using your Companions to Focus the Doctor’s attention, and then discard any excess dice. The total of all the Dice Add icons on all your Doctor, Companion, and Equipment Timey-Wimey cards to find your Starting Dice Pool. You may play Event and Transfer Timey-Wimey cards to get more dice as well. 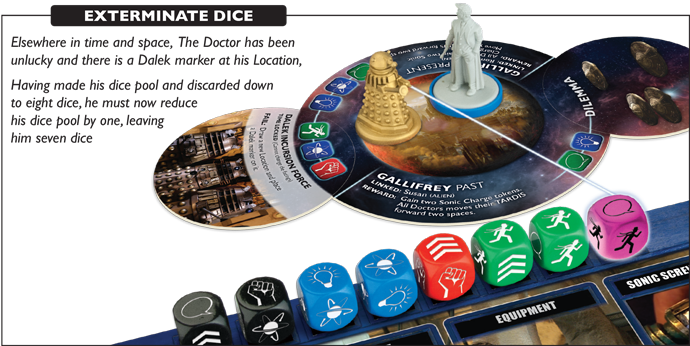 Gather the matching Story Dice and place them in the Dice Pool area of your TARDIS Console. Each Dice Focus icon on a Companion card allows you to exchange a die of that colour for one of your Black dice. A Dice Focus icon with a split colour gives you a choice of exchanging a die of either colour for a Black die. Example: Looking at the challenge he is facing, The Doctor sees that focussing more on Blue and Red dice would be useful. The Doctor uses Rory Williams to swap in one Black die for a Blue die and Captain Jack to swap in a Black die for a Red die. Both Amy Pond and Captain Jack could exchange a Black die for a further Green or Red die, but the Doctor decides that he has enough of those colours. Then, with nine dice in his Dice Pool, The Doctor then elects to discard a Black die to get down to the eight dice limit. The Doctor’s Dice Pool is limited to a maximum of eight dice. If, after adding and focussing dice, you find yourself with more then eight dice, you must discard any excess dice. The Doctor has been unlucky and there is a Dalek marker at his Location. Having made his dice pool and discarded down to eight dice, he must now reduce his dice pool by one, leaving him seven dice. Some Doctors, Companions, and Timey-Wimey cards have Dice Re-roll icons. These icons grant you re-rolls of dice of their indicated colour. Each one may be used once per Adventure. • NUMBER: Allows you to re-roll up to that number of dice of the indicated colour. • ANY: Allows you to re-roll any or all dice of the indicated colour. • ALL: Allows you to re-roll all (but not anything less) dice of the indicated colour. You may spend two Sonic Charge tokens to re-roll any one die. This can be done as many times in an Adventure as you have Sonic Charge tokens to spend on doing so. You may discard a Black die (reducing the size of your Dice Pool) to re-roll all of your dice. This can be done as many times in an Adventure, as you have Black dice to discard doing so (although eventually, you will have too few dice to finish the Challenge). If your first roll was so bad that no amount of dice manipulation is going to help you, it might be wise to discard a Black die and re-roll everything. On the other hand, if you’re already close enough to success, it might be better to use some of your card abilities and Sonic Charge tokens first, saving discarding a Black die for a last-ditch re-roll after you’ve tried everything else. Example: So far, The Doctor has only matched three of the symbols he needs to meet the Challenge: 1 Cunning, 1 Science and 1 Tactics. Being the Eleventh Doctor, his Bow Tie allows him to re-roll up to two Black dice. One of the re-rolled dice comes up with Cunning, so he now has four matching symbols. You may spend three Sonic Charge tokens to change the facing of any one die to any symbol. This can be done as many times in an Adventure as long as you have enough Sonic Charge tokens to spend. Example: The Doctor is doing well so far, having five out of the six symbols required to complete the Challenge. Fortunately Amy Pond is one of The Doctors companions and she allows him to change one Green die to Diplomacy. 1. Gain the Reward given by the Time Zone they are in, on their Location. 2. Remove one Dalek marker from this Location (if there are any to remove). If they are on Earth, they only remove a Dalek marker if it is in their Time Zone. 3. Promote all Part-Time Companions to Full-Time Companions by moving them up to connect with the TARDIS Console. 1. Dismiss all Part-Time Companions and shuffle them back into their Companion decks. 2. Add one Dalek marker on this Location. If they are on Earth, place the Dalek marker in their Time Zone. 3. 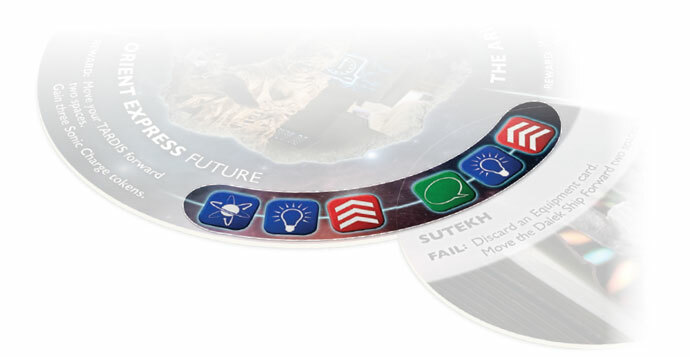 Complete the actions listed as the Fail cost on the Dilemma tile. If you don’t think you will be able to complete the Challenge on your own, you may choose to call in help from another Doctor during the Create the Dice Pool stage of the Adventure step. To do so, discard a Sonic Charge token or Timey-Wimey card and choose another player to help you. That player now chooses to either help you from afar or come to your Location. 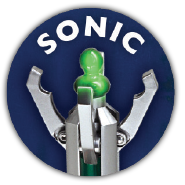 If the helping Doctor decides to help you from your Location, and is not already at your current Location, the helping Doctor must discard a Sonic Charge token or Timey-Wimey card to move their Doctor to your Time Zone and Location. Unless the Location is a Time-Anomaly, whenever a Doctor helps another at the same Location, you must move the Dalek Ship forward two spaces. 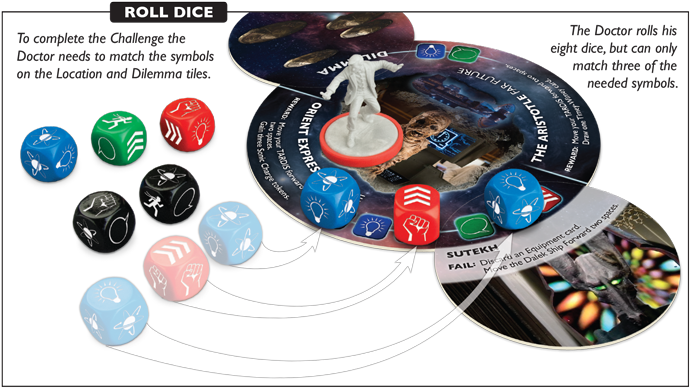 You must split your Dice Pool with the helping Doctor, allowing you each to focus on part of the Challenge. 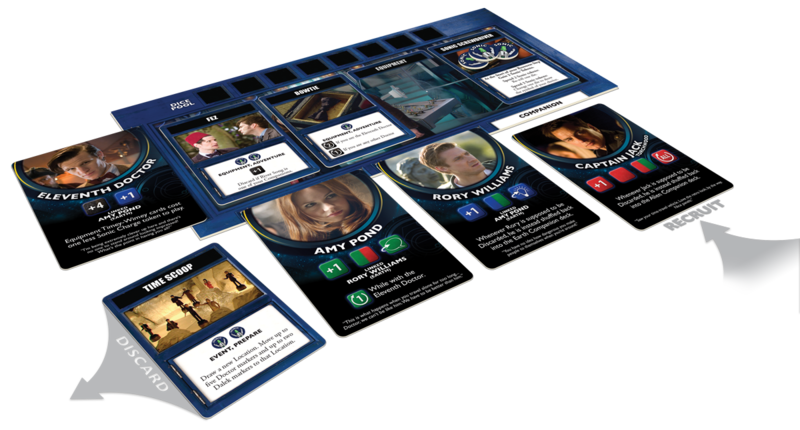 Each Doctor may only use their own Doctor, Companion, and Equipment cards on their own Dice Pool (unless they are an Any Adventure Timey-Wimey card, then they can be used on either Doctor’s Dice Pool). If a Doctor discards a Black die to re-roll all his dice, he only rolls his own Dice Pool. The other Doctor must discard their own Black die to re-roll their Dice Pool as well. If any dice are Exterminated from the Dice Pool, the Doctor being helped chooses which die will be discarded. Example: The Twelfth Doctor must split his Dice Pool. Since the Fourth Doctor is helping him from the same location, the Twelfth Doctor has a Dice Pool of five dice, while the Fourth Doctor has a pool of three dice. This gives them plenty of options of which dice to keep and which to discard. Remember, whenever you are building a dice poll always gather all the dice you can and do all your Dice Focusing before discarding down to your dice pool limit. • The helping Doctor has a Dice Pool of one die. • The Doctor who is being helped has a Dice Pool of seven dice, or six dice if the Dilemma or Time Anomaly has the Time-Breach condition. • The helping Doctor draws one Timey-Wimey card. • The helping Doctor must discard one Sonic Charge token or Timey-Wimey card. • The helping Doctor has a Dice Pool of three dice. 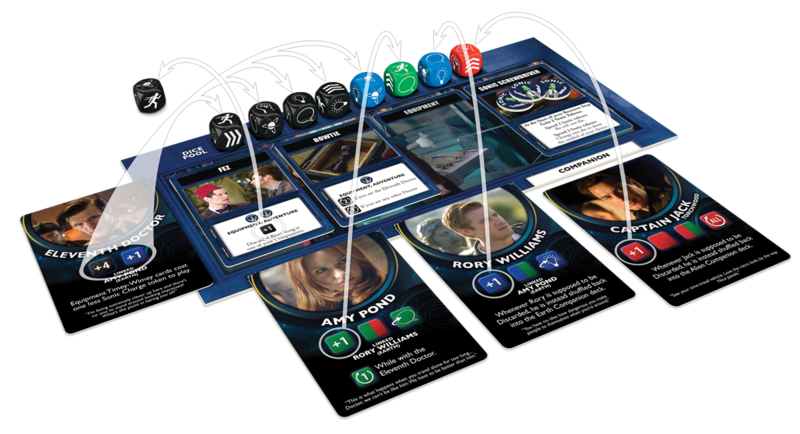 • The Doctor who is being helped has a Dice Pool of five dice, or four dice if the Dilemma or Time Anomaly has the Time-Breach condition. • The helping Doctor also gains the Reward given by the Time Zone they are in on their Location. • Remove an additional Dalek marker from this Location. If they are on Earth, they only remove an additional Dalek marker if it is in their Time Zone. • Add an additional Dalek marker on this Location. If they are on Earth, place the additional Dalek marker in the their Time Zone. 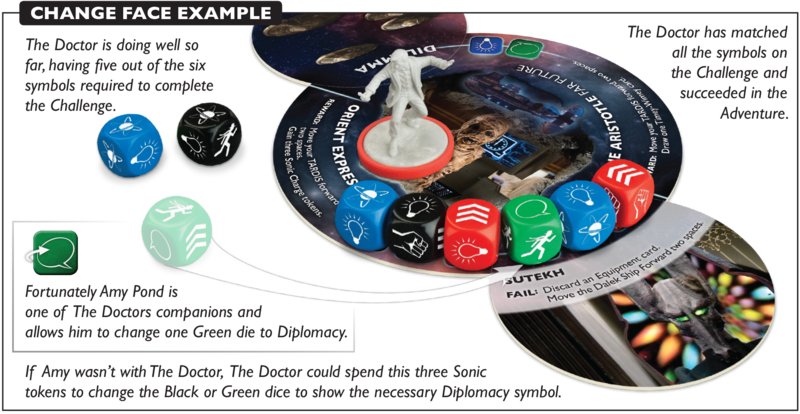 • Complete the actions listed as the Fail cost on the Dilemma tile for the helping Doctor as well as the Doctor being helped. Some Dilemmas and Time Anomalies force the Doctors to regenerate. When the Doctors regenerate, each player takes the next highest numbered Doctor card available, passing on their old Doctor card to another player if necessary. If you are already at the highest-numbered Doctor available, you regenerate as the First Doctor. Remove your old Doctor marker from your coloured base and replace it with the Doctor marker for your new regeneration, placing it where your previous Doctor marker was. "Never forget, Doctor, you did this! I name you forever: You are the Destroyer of Worlds!" After the last Doctor has had their turn, before starting the next round the Daleks have their turn. At the start of the Dalek turn, move the Dalek Ship forward one space on the Web of Time track. Example: At the start of the Dalek turn the Dalek ship automatically moves one space. It lands on a space with a Time Anomaly marker, so the players must discard the marker and draw a Time Anomaly card. 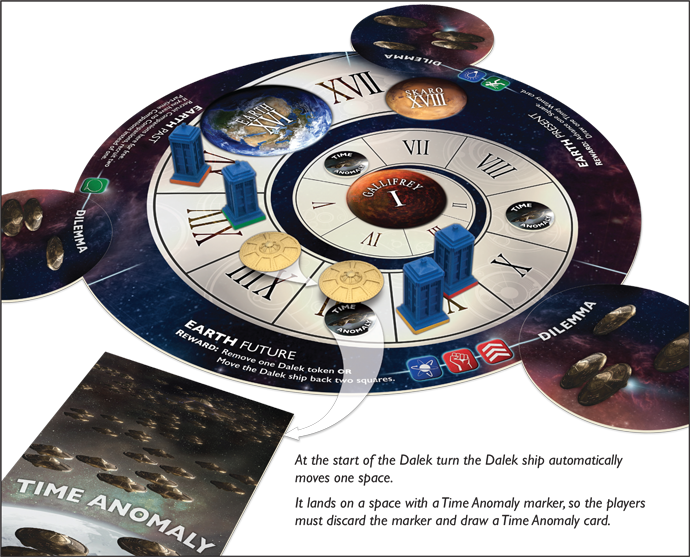 Any time the Dalek Ship lands on or moves through a space containing a Time Anomaly marker, remove the Time Anomaly marker and draw a Time Anomaly card. The Doctors should deal with these quickly, as they will make their tasks more difficult. there are three Dalek markers on Earth. If the Daleks did not win, any Doctor that has reached Gallifrey, the last space on the Web of Time track, wins and saves all of Time and Space from the Daleks.